For all of my life, though she died before I was born, Eleanor Rathbone has been around me. When I got my first proper job working in Everton for the Liverpool City Housing Department, I would pass the Victoria Settlement on my way to work every day. Still going then, it had been Liverpool’s first women’s and children’s community centre, set up and run at the beginning of the 20th century by a group of enthusiastic feminists, including Eleanor Rathbone. 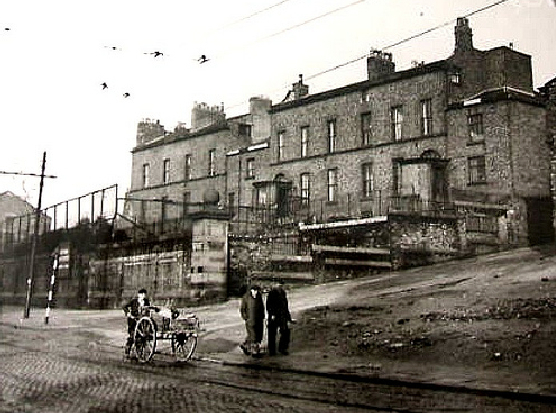 Victoria Settlement, Netherfield Road, Everton. Then doing my Sociology degree at the University of Liverpool I was based in the Eleanor Rathbone building. She founded the department. The department I’m once again a member of, from September 2018, as I begin my MA and PhD. Working at Liverpool Housing Trust I once booked Greenbank House, owned by the University by then, for a Board meeting. And when we got there LHT Board member Margaret Simey said to me ‘You know, the last time I was here I was taking tea with Eleanor Rathbone.’ This had been the Rathbone family home from the 18th century until after Eleanor Rathbone’s death. Margaret of course was a City Councillor representing Granby Ward for many years, as was Eleanor Rathbone from 1909 to 1935, Liverpool’s first female Councillor. And these last few years much of my own time has gone into helping the people in Granby work on the future of their place. 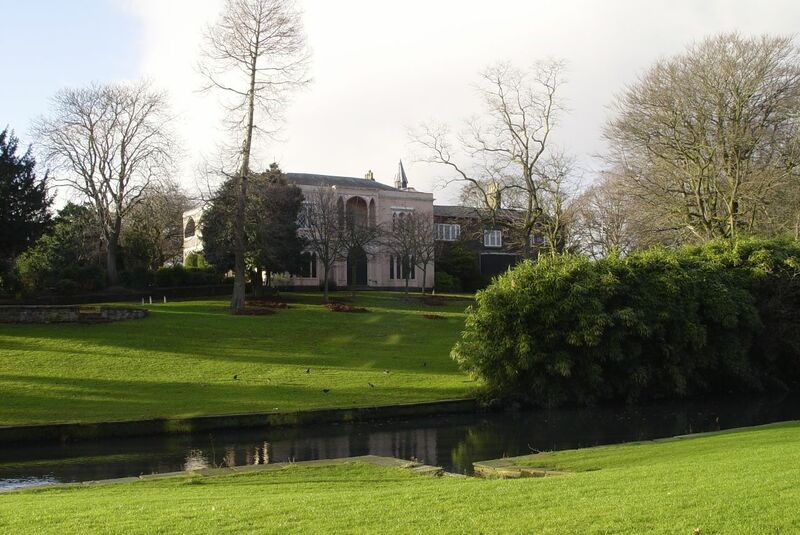 Hardly a day goes by without me running past Greenbank House these days. Writing this blog it keeps turning up. In stories of an earlier Rathbone and William Roscoe and the abolition of slavery. And walks where I show the lovely and now disused house to startled friends who are always deeply moved to know they are standing where the great Eleanor Rathbone lived and grew up. Sarah Horton, walking where Eleanor Rathbone walked. And of course as a child I was amongst the first generations whose mothers were paid the Family Allowance. 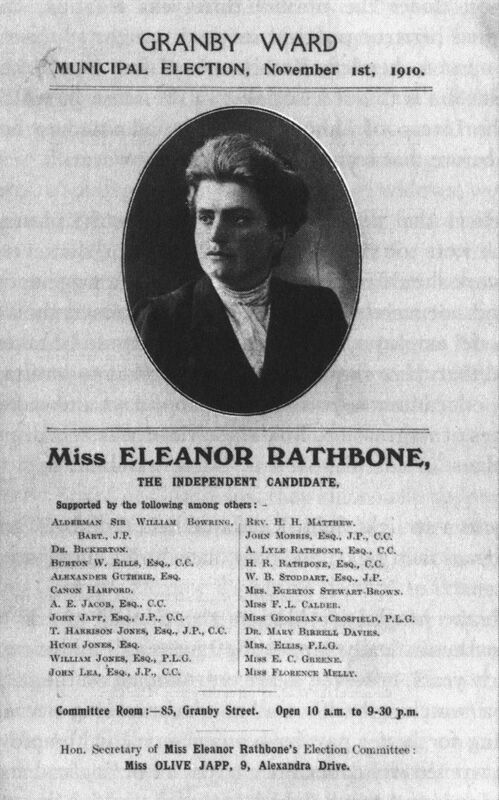 Eleanor Rathbone’s final and towering achievement after she had earlier played such a crucial part in getting all those women the vote. I am privileged to walk where she walked and to have lived in her benign shadow. I’m not sure we would have got on though. She was a very reserved Victorian, the product of such a different age. Even writing this, all on my own on a computer in the 21st century, I can’t be so familiar as to call her ‘Eleanor’ even in my mind. I think she’d take it as presumptuous over-familiarity. So, full name or the more modern ‘Ms Rathbone’ will have to do. I’m familiar enough with how she was to suspect this because I’ve recently been reading a very thorough and scholarly biography of her. ‘Eleanor Rathbone and the Politics of Conscience’ by Susan Pedersen was one of the first books I borrowed from Liverpool Central Library when it reopened. It’s an extremely well researched and written book that ended up only increasing my already high respect for Eleanor Rathbone. Coming from a prominent and secure Liverpool Liberal family she was never poor. But from very early in her life we see her minding that other people were and doing things about it. Her focus was always and instinctively the position of women as the poorly or unpaid members of the economy. Forever subservient to the positions and interests of men. Principally bringing up the next generation of citizens, dependent on voluntary handouts for housekeeping from husbands who may have cared deeply, but were under no duress to necessarily do so. After early social work and political experiences in Liverpool, by World War One she is in London sorting out how the state will support women whose husbands are at the Front, or dead. And I was surprised to find out what a tireless but patient negotiator she was. During all these early years she’s been a prominent feminist promoting women’s suffrage. But actually the feminist camp divided roughly in two. There were the ‘equalitarians’ who wanted the vote so that a woman might do anything that a man could do, and were prepared to break the law to get it. Then there were the ‘social reformers’ who wanted women having the vote to improve the social and economic positions of all women in society, but would countenance no law-breaking whatsoever. Eleanor Rathbone was a social reformer and though influenced by the equalitarians thought their use of arson to make their point at times was indefensible. 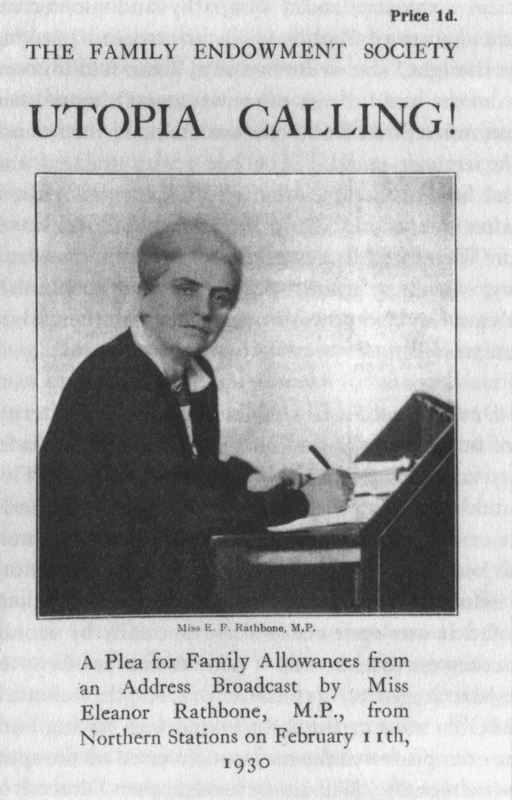 Whilst equalitarians, such as the Pankhursts, found the likes of Eleanor Rathbone too patient, too gradualist. I think that’s a fair summary. 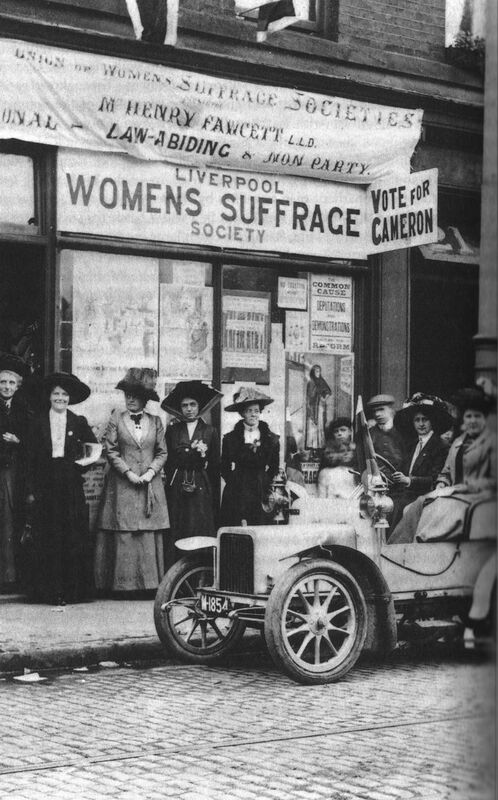 Liverpool Suffragettes campaigning in Kirkdale in 1910. Eleanor Rathbone is third from left. But there was usually more uniting the suffragettes than dividing them and in 1928 the Equal Franchise Act was finally passed, Eleanor Rathbone entering Parliament a year later. And again I was surprised to read what a constitutionalist she was, what a devoted Parliamentarian, what a supreme operator. But she was never a member of a political party. Though coming from a Liberal family she always stood in elections as an Independent. So was therefore never subject to party discipline or in-fighting and would work with sympathetic souls wherever she could find them. And work she did, too much and too many achievements to set out in a short blog post. So read the book. If you’re interested in feminism, politics, economics or Liverpool then you owe it to yourself. It’s superbly done and when it finished I was sorry. A few highlights to end. She was an early opponent of Appeasement, where much of the British political and upper classes took a hands-off approach to Adolf Hitler and the Nazis invading much of Europe, in the hope that they would leave Britain alone. In this Winston Churchill and her were mutual supporters and continued to have a great deal of time for each other. She was very well connected and knew what the Nazis were doing to Jewish people in Germany long before the war. Campaigning vigorously, if largely unsuccessfully, to get the Government to recognise the situation and take what action it could, and then to accept refugees and get other governments to do so too. When the Spanish Civil War was lost, early in 1939, she hired a ship to run the blockade of Spain and bring Republicans threatened with reprisal to safety. During both World Wars she refused high honours for her war work, saying it was as nothing compared to those who were risking their lives every day in the fighting. 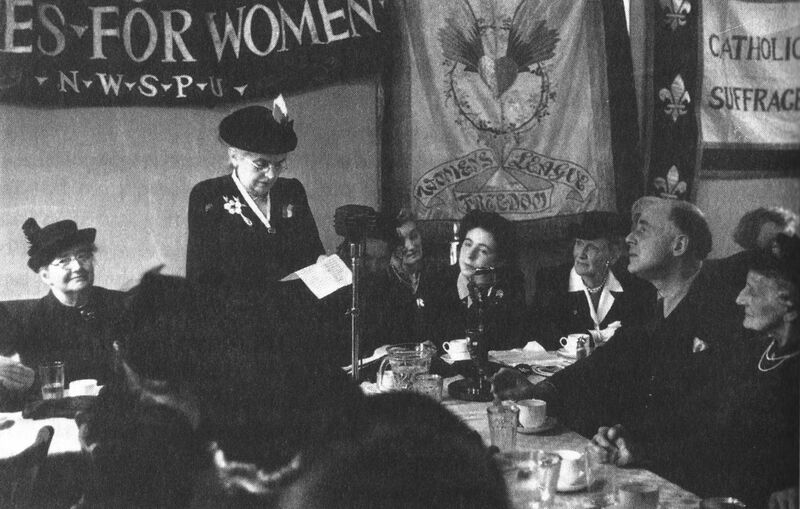 Eleanor Rathbone speaking in 1943. A wonderful picture, the people in the room clearly knowing they are in the presence of someone special. Nancy Astor is third from right. The book also tells us about Elizabeth Macadam. Missing from the only other biography of Eleanor Rathbone at her own insistence, but actually, from early days at the Victoria Settlement in Everton to her dying day in London, Eleanor Rathbone’s great friend, collaborator and constant companion. It was a different age. It was different for women then. But these two did as much as anyone to change it. From Eleanor Rathbone to Elizabeth Macadam in 1929. University of Liverpool Rathbone Exhibition, October 2018. 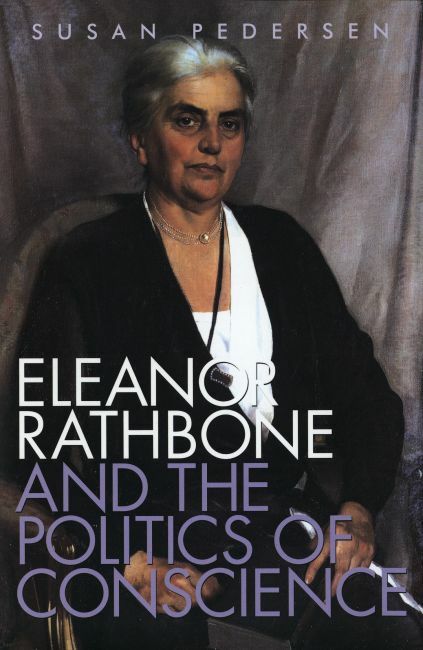 ‘Eleanor Rathbone and the Politics of Conscience’ is published by Yale University Press, ISBN 0-300-10245-3 and is available from all good public libraries. If you want to buy it, go to your local independent bookshop. In Liverpool ‘News from Nowhere’ are selling it. Thank you so much for this, Ronnie. Eleanor Rathbone on socialism was, alone, worth the price of admittance (as they say). I just wish we had politicians like her today. Thank you Gerry, I think you’d enjoy the book. So often biographies end up making me think less of people, but not this one. Thanks for this interesting, instructive and welcome flagging up of Eleanor Rathbone’s work. Maybe you could encourage someone in Liverpool to write an Illuminated Letter to her and send it for it to be exhibited along with Letters to other important inspirational women figures as part of our work with Gallery of Modern Art Glasgow? Find information on Illuminated Letters Letters on the Glasgow Women’s Library website. We could find someone here in Glasgow but would be so much more poignant coming from a beneficiary of her work in Liverpool. Thanks Adele, If I were a woman I’d write her an illuminated letter myself. I’m full of admiration for Eleanor Rathbone and would have so much to say to her and thank her for. For Liverpool readers who might be inspired, find out more here. What a great history lesson. It shows how ignorant I am of prominent women who influenced English politics for the better. I am going to try to find this book (or any others that mention her) in one of our public libraries in California. It’ll be interesting to see what we know here about this wonderful woman. Probably not that much Jan. She’s not all that celebrated in England, the author of the book thinks that’s because she never had a political party to look back and honour her, as others have. That’s partly why I so wanted to honour her achievements myself. Thank you for such an interesting article. I am going to look for the book about Eleanor Rathbone when I am next in Central Library! One thing I would like to mention is that my understanding of the campaign for women’s suffrage is that it was the constitutional feminists who were the ‘equal righters’, and in fact Millicent Fawcett believed strongly in no special treatment for women. I think she may have been opposed to the Family Allowance? The Pankhursts, on the other hand, saw winning the vote as part of a wider struggle against a male dominated society. They did not believe so much in ‘equal rights’ to have a seat at the men’s table, but had a more radical agenda to improve women’s lives. Emmeline Pankhurst very clearly articulated the ways in which women were oppressed, calling for the end of a system of entitlement and impunity that saw young girls sexually abused and the public and private spheres rendered unsafe for women; Sylvia Pankhurst was a socialist and worked with poor women in the East End of London. In many ways, Eleanor Rathbone (Ms Rathbone!) may have had more in common with them even though she rejected their militant tactics in the struggle for the vote. It was a very complex and interesting movement. They were all very brave, in particular the women who went to prison for the right to vote, and the ‘Welfare Feminists’ such as Eleanor Rathbone who fought long and hard to bring the needs of women and children to the attention of parliament and the country. We are all indebted to them, and in many ways, the struggle continues. You’re right, it was clearly a complex situation and one even harder to understand from nearly a hundred years away. But we all owe a very great deal to all of them. The book is very good and I’ve seen it in the Central Library recently, so you should easily be able to get it. The newly established group Remembering Eleanor Rathbone are planning a series of events and projects in 2016 which will be 70 years since this amazing woman died. These will take place in Liverpool, London and Oxford and will seek to both commemorate the many campaigns she fought and to relate them to the same or similar issues today. Events will be advertised on http://www.rememberingeleaborrathbone.wordpress.com and elsewhere. All ideas for ways to commemorate Eleanor and to pass on her ethics of responsible citizenship are welcome. Rescue the Perishing, Eleanor Rathbone and the Refugees published by Vallentine Mitchell This describes her relentless campaigns on behalf of the mainly Jewish refugees from Nazi Europe for which she earned the accolade the Refugee MP. Thanks Ronnie for these insights and wonderful photographs. I too used to travel past the Victoria Settlement and Ann Fowlers Home on Netherfield Road on my way to school at Blackburne House. Later like you I too worked in the area for Liverpool Council Housing Department. I was familiar with the Rathbone history from the oral history that my parents told us. It is such a shame that many of Eleanor’s letters were destroyed at her insistance after her death. I think you are right – her lack of recognition owes much to her staunch belief in the need to be free to campaign and follow her convictions, not with a party whip. However her gender must also be seen as a contributing factor. Some time ago HERSTORIA published a womens history walk of Liverpool, although slightly out of date now because of redevelopments it guides you through some of the areas that Eleanor would have been familiar with. Thanks Lin, and for the walk. Sounds like I should do it some time soon. 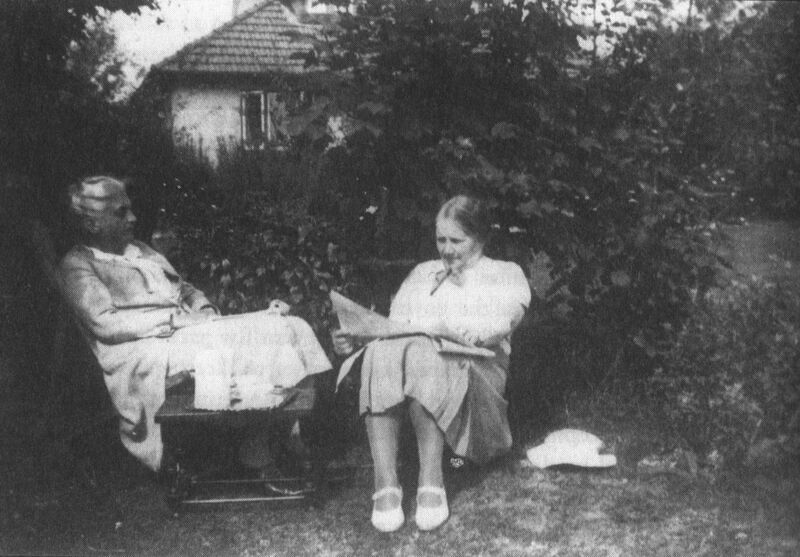 As for Eleanor Rathbone, 2016 will be the 70th anniversary of her death and, since writing this post I’ve got involved with some people trying to mark the year and also make Eleanor’s work and achievements better known, particularly to the children and young people still growing up benefitting from what she did today. Really interesting walk Lin, I am going to ask some friends if they want to do it with me. Can you let us know about what’s happening to commemorate Eleanor Rathbone please Ronnie, it would be good to get involved. Sure, if you’d like to get in touch directly. Contact details on the website. Hi veichenblau. Yes the walk really throws a different perspective on the city of Liverpool.There have been some redevelopments and some are still ongoing along the route since the walk was conceived but it is still very intriguing. Plenty of great watering holes along the route too. You may notice that my ‘Balloon debate’ on Eleanor appears as a link on the site. It was used as part of an HEA project to produce a tool kit for 1st year History BA students at Edge Hill University. It occurred to me that not many students were aware of her as a political figure and to me she made the ideal candidate for the balloon. Looking forward to all the events this year. More details on our plans to Remember Eleanor Rathbone throughout 2016. This will kick off with an exhibition at Liverpool Central library ( official opening 14 January at 1pm) and will be followed by Dr Susan Cohen being the speaker the Roscoe Lecture (5pm that day) – more details to follow. KEYNOTE SPEAKER: Professor Susan Pedersen, Professor of History, Columbia University, New York and autheor of ‘Eleanor Rathbone: The Politics of Conscience.’ Professor Pedersen’s presentation ‘The Ladies Vanish’ will explore the network of female support that underlies Rathbone’s achievements. And to request the Cabinet to support the installation of a commemorative artwork (funded in part by public subscription) in Greenbank Park (which was part of the family estate prior to its sale to the City Council in 1897). Enormous thanks to Councillors Laura Robertson-Collins and James Roberts for proposing this excellent resolution. Yeaterday, 2nd January was 70 years since Eleanor Rathbone died after a life time of campaigning for the under-represented. I do hope readers of this blog will be supporting the events that will be taking g place during 2016. Please see our website. 1200 people have booked for the Roscoe lecture on 14th January to learn about Eleanor Rathbone. Their biggest booking. The exhibition at Liverpool Central Library is there now, on the Third floor, Liverpool Records Office. Sponsors: Luciana Berger, Frank Field, George Howarth, Steve Rotheram, Chris Law. That this House commemorates the long-term champion of women’s suffrage, social reform and refugee rights, Eleanor Rathbone, on the 70th anniversary of her death; notes her many achievements as the first female member of Liverpool City Council and as Member of Parliament for Combined English Universities from 1929 until the year before her death in 1946, and her campaign to secure the introduction of the Family Allowance in 1945; further notes her exceptional contribution to the rescue and welfare of refugees from Nazi Europe; supports the events taking place in Liverpool and across the country to commemorate her work; welcomes plans to install commemorative artwork in Greenbank Park, Liverpool; and commends the work of the Remembering Eleanor Rathbone campaign and the ongoing work to ensure that the life and work of Eleanor Rathbone is remembered and celebrated. Well done to all concerned. Such a pity Liverpool felt it couldn’t recognise her with a posthumous Freedom of the City as we requested. I felt strongly that we need to ensure she is remembered and recognised for generations to come as one of the most inspirational people ever to come from Liverpool, and that this level of honour would have achieved that. A missed opportunity for the City and for generations to come. 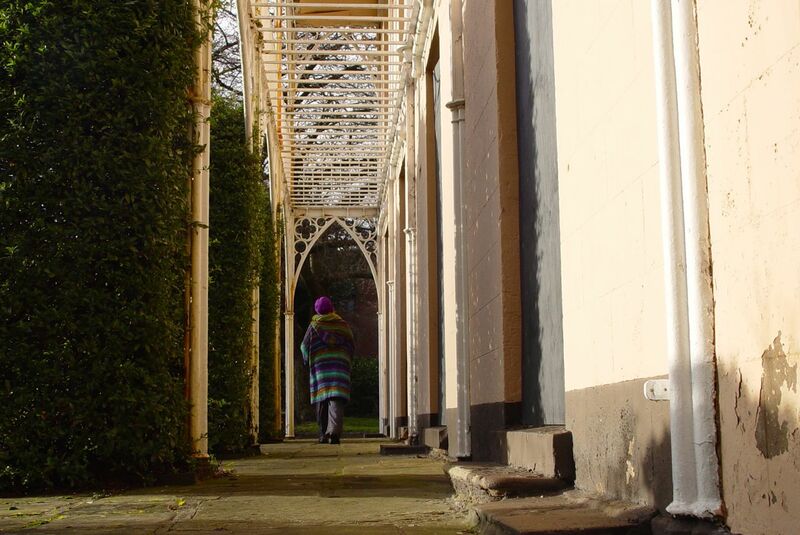 Liverpool Greenbank councillors have plans underway to install a specially commissioned artwork in commemoration of Eleanor and her wide ranging campaigning work and achievements in the walled garden at Greenbank Park. There could be no more fitting place for this, as the garden was once part of the Rathbone family estate. We need your help to raise funds for this permanent memorial and will be setting up a public subscription page. 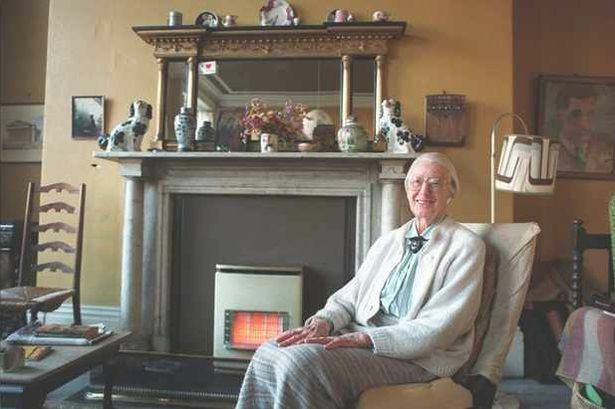 It’s a pity we do not have people like her today, all the M Ps think about how they can better themselves , Rather than take a stand against the Bedroom tax, this is making more and more people homeless.